﻿﻿﻿﻿﻿﻿﻿﻿Why we shouldn’t curse the seaweed piles on the beach. ﻿﻿﻿﻿﻿﻿﻿Miles from shore, patches of golden yellow bob on the blue waters of the Gulf of Mexico like a vast flotilla of partially inflated life rafts. These mats of sargassum, a vine-like algae, provide habitat and food for a wide variety of marine species throughout the Gulf and the North Atlantic. Most Texans know it as “seaweed” and encounter it only when it’s washed up on the beach. It plays an important role there as well, helping to build up and strengthen dunes — important for protection from storms — and contributing nutrients to the beach ecosystem. Sargassum concentrates in the Sargasso Sea, 988 million acres in the North Atlantic subtropical gyre (large system of rotating ocean currents), bounded by major currents. It floats unattached to the seafloor and reproduces vegetatively, meaning new mats grow from parts of other ones rather than from seeds or spores. That makes the Sargasso Sea essentially one enormous super-organism. And a “super” organism it is. The Gulf of Mexico produces about a million tons of new sargassum each year, says Larry McKinney, director of the Harte Research Institute for Gulf of Mexico Studies at Texas A&M University–Corpus Christi. More than 100 species of fish spawn in the Sargasso Sea, including white marlin and dolphinfish, and the seaweed functions as a mobile, open-sea nursery for many species of marine life, including billfish. Young loggerhead, hawksbill, Kemp’s ridley and green sea turtles hide from predators in the mats and eat both the algae and creatures living in it. Commercial fish such as tuna pass through the Sargasso Sea on their annual migrations and depend on the mats for food, as do humpback whales and a variety of birds. About a dozen species spend their entire lives in sargassum mats. The seaweed also may generate the bulk of marine snow, particulates that fall toward the ocean floor more than a mile below, providing nutrients to creatures throughout the water column. The seaweed is protected in U.S. waters off the southeast coast through the authority of the U.S. South Atlantic Fishery Management Council. Critical habitat for a population of endangered loggerhead sea turtles, designated by the National Oceanic and Atmospheric Administration in July, includes a large swath of sargassum habitat in the Gulf of Mexico and Atlantic. In March 2014, the Azores, Bermuda, Monaco, United Kingdom and United States signed an agreement forming the Sargasso Sea Commission to collaborate on conserving the resource. That agreement is voluntary, however, and the commission has no management authority. This situation leaves sargassum vulnerable to serious threats, including pollution from oil, bilge and ballast water discharge from ships; plastic waste from ship- and land-based sources; fisheries bycatch; harvest for use in fertilizer, biofuel and pharmaceuticals; climate change and ocean acidification. 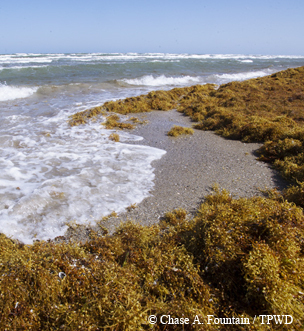 A bumper crop of sargassum washed up on Texas shores in 2014. Anywhere from 4.5 to 12 million tons of sargassum float in the Gulf and Atlantic at any one time. The exact amount is hard to measure because the mats sink during storms and break up and move with currents. It is also hard to know just how much ends up washing ashore, as this variable amount depends on several factors. In early summer 2014, Texas beaches were covered with a bumper crop of the stuff, most likely due to a cold winter that killed a lot of the seaweed, followed by winds driving it ashore. On May 22, more than 8,400 tons hit a 3.3-mile stretch of Galveston beach, the most ever recorded for a 24-hour period in the area. In response, the city put up educational signs and handed out fliers, asking visitors to be tolerant and recognize that the seaweed is an important part of the Gulf ecosystem. The Galveston Park Board even sent out 50 trained volunteers, dubbed the Bucket Brigade, to interact with beach-goers and introduce them to the interesting creatures living in sargassum. Most Texas communities regularly clear away as much of the seaweed as possible, though. Galveston pushes it to the back of the beach where it can decompose naturally. Port Aransas uses a method called front-notching; crews cut a “notch” about 40 feet deep and a few hundred feet long in the front of the island’s tall dunes, then scoop up the seaweed and pack it into the notch. City officials aren’t happy with the way this looks, though, and have been testing equipment modified to pick up more seaweed and less sand. Based on the results, they may use the equipment to move seaweed to an out-of-the-way location and let it break down, which it does fairly quickly. Researchers at Texas A&M University–Galveston compressed washed-up sargassum as a base for creating dunes and are evaluating whether these seaweed-anchored dunes can better withstand the force of ocean waves and storm surges. Scientists at the Harte Research Institute in Corpus Christi are studying sargassum’s role in the beach ecosystem and how efforts to clear it affect that ecosystem. Given how much this hard-working seaweed contributes to a healthy Gulf ecosystem, those guidelines will come in handy.